When living on the edge (read: running the latest betas of everything) as I do, you get trouble from time to time. This time it was Visual Studio 2008 "Data Dude" combined with SQL Server 2008. For those of you not familiar with it, "Data Dude" is an extension to Visual Studio for working with databases; unit testing of your database, automatic data generation etc. My problem was that I kept getting a message saying "Object reference not set to an instance of an object." all the time when I tried to create a new database project. I suspected that SQL 2008 was the cause, and I was right. It turns out that "Data Dude" creates a temporary database when you're opening or creating a project. In my case this happened in the default SQL Server instance on the machine, which is SQL Server 2008 CTP5 Dev Edition. "Data Dude" didn't like that very much. "Design-time Validation Database". Fill in the instance name of a SQL 2005 instance in the text boxes. So now you know! I've been working a little with SQL Server Compact Edition (which is a *very* cool product, by the way) lately. For those of you that haven't heard about SQL Compact: It's a small version of SQL Server that you host in-process in your .NET applications (it's just a couple of MBs) with full support for tables, indexes, transactions and so on (but no views, stored procedures or triggers). Much like SQLLite and Apache Derby, just better integrated with .NET. So far I've been using Visual Studio to create and manage databases. This works great, but I didn't like to start up VS and everything just to peek into a database, and I've always felt more at home in SQL Server Management Studio (SSMS) when working with databases. Well, it turns out that SSMS can be used to manage SQL Compact databases as well! Cool, I didn't know that. Robert has some more on this on his blog. Vista SP1 RC and Windows Server 2008 RC1 is now available to MSDN subscribers! Vista SP1 will also be available as a public download from Microsoft sometime next week. 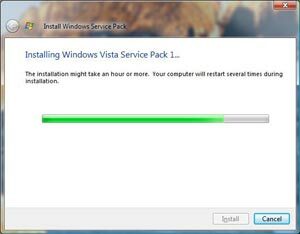 I downloaded and installed Vista SP1 yesterday, and everything went smooth. I haven't noticed much difference yet, but I haven't looked much either. I also downloaded Windows Server 2008 RC1 and upgraded the server hosting this site (from RC0). I had some trouble initially, because the RC1 upgrade is blocked if you have SharePoint installed (probably due to the fact that they have removed the SP role from Windows and are providing it as a separate download). I had SharePoint installed, but the server Role had disappeared, so I couldn't uninstall it! After some thinking I solved it by getting the separate SharePoint download, which offered me an uninstall option when I ran it. 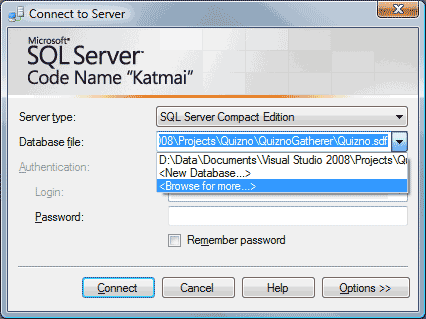 SQL Server 2008 "Katmai" November CTP Released! There you can find DVD images and self extracting executables for x86, x64 and IA64. This CTP includes SQL Server Express Edition as well. I month ago my team (Åsmund Eldhuset, Frank Robert Kvam and me) came second in the Nordic Collegiate Programming Contest at NTNU (13th in total) and thereby qualified us for the Northwestern European Programming Contest (NWERC) in Utrecht, The Netherlands. NWERC is happening this weekend, and the contest itself is today. You should be able to follow the standings live at http://2007.nwerc.eu/live/scoreboard, and if the web cam works (it doesn't right now, it looks like), you should be able to see us as well here: http://2007.nwerc.eu/live/cam3. Microsoft Norway is running a gadget competition at http://www.gadgetcompetition.no/ these days where users can submit Vista Sidebar Gadgets and Windows Live Gadgets. 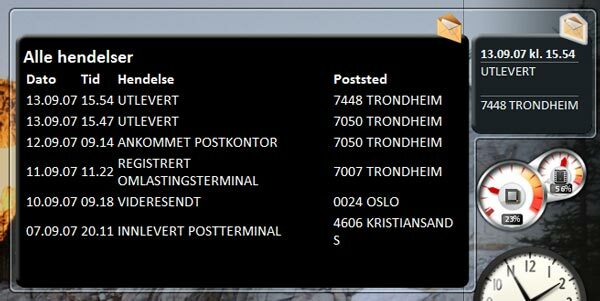 My contribution is a Vista Sidebar gadget where you can track packages and letters sent via the Norwegian Postal service, Posten. By entering you package tracking number, the gadget will get the latest updates for you package every 30 minutes and display its status in the sidebar. You can also click the envelope to open up the full package history in a fly out window. That is, the exam result is the product of effort, skills and how lucky you are. Here, all factors are non-negative, which gives us a non-negative result as well. A result of zero is a fail, anything above that is a pass. Is P = NP? Prove your answer. Result / Effort = Skills x Fluke. This tells us that, if you got a non-failing grade on the exam, while the effort approaches zero, you either have extreme skills, or you had a huge amount of luck. We can also get Result / Skills = Effort x Fluke. So if you got a passing grade, and have zero skills, you put in impossible amounts of effort, or had impossible amounts of luck, which is just not possible, so you could not possibly pass the exam. So, by using this formula, you should be able to develop a strategy for receiving good exam results Good luck!